Paul Phong Duong was born and raised in a farming village south of Saigon in Vietnam. At the age of ten, he left Vietnam as one of the last “Vietnamese Boat People.” Duong came to Canada from Malaysia and now lives in Toronto, Ontario. He holds a university degree in computer science. [Aylmer, Quebec]: Deux Voiliers Publishing, 2012. 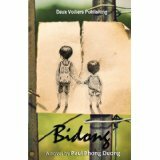 Bidong by Paul Duong is a powerful narrative about the hardship of two brothers who leave their small farming village in Vietnam to start a new life in North America. The story, based largely on Duong’s own experience as a boatperson, is a rare glimpse into life in rural Vietnam and the traumatic experience that Vietnamese refugees underwent in escaping Vietnam by sea.